Rosalind Franklin is one of the unknown founders of modern-day genetics. Her research and findings were the reason that those who we know to be the geniuses behind the DNA structure received their fame and fortune. She was ahead of her time and fought countless battles in her life, right up until she died. 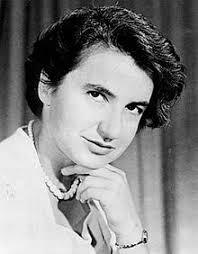 I feel drawn to Rosalind Franklin, as she was a genius who died before seeing the true impact and results of her work. I admire Rosalind Franklin’s perseverance in the face of challenges, whether they were job-related, mental or medical, she was always strong. She spoke her mind and wasn’t afraid to stand out. In her time, she was looked down upon, considered strange, both for her behavior and because she was a prominent woman in her field. I know that I will never be fully able to relate to Rosalind Franklin because of the rights and privileges I have today that she did not. Without Rosalind Franklin’s contributions to the fields genetics and chemistry have forever influenced science today. Without her work in crystallography we may still be many decades behind in our findings. Indirectly, Franklin’s research has saved countless lives; as every piece of gene editing, scanning, repairing technology wouldn’t exist without her. For a person who lived as short a life as she did, it’s shocking how much she managed to accomplish. Yet she isn’t recognized. For years no one would know what she did, or even who she was. She was barely a footnote in Watson and Crick’s transcripts. This year for eminent, I intend to shed light on what an incredible person she was. I look forward to my next step, which will be searching for someone to interview who can hopefully open the door to more knowledge surrounding this dark lady of DNA. Hear that Eminent? Bring it on.